The Sleuthers wanted new year cheer and that’s exactly what they got! It didn’t even matter that they didn’t spot the liar as spirits were so high when the first Perfect Liar of 2019 stepped forward. It looks like the Suspects trumped the Sleuthers this time. We had four stories that flummoxed the Sleuthers as votes were evenly spread. We had the tale of the smoking punishment from a well-meaning mother, making a stand as adults with ice cream cake and a SWOT team raid, an uninvited guest and the convoluted escape plan, and finally the tale of behaving badly and broken dreams in a Swedish furniture store. 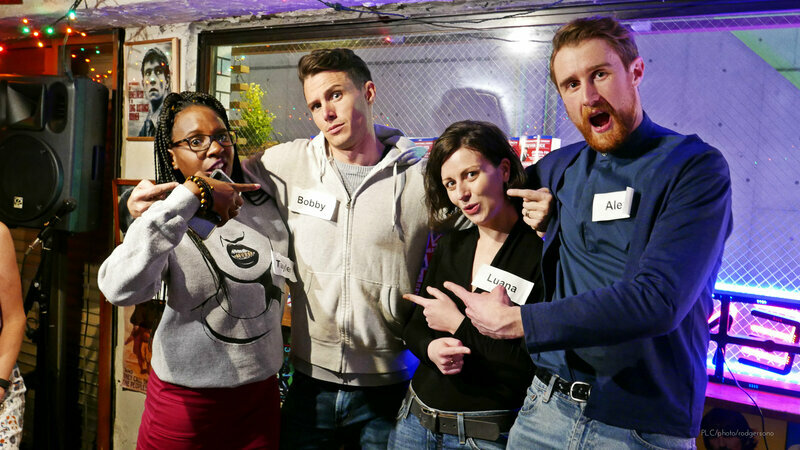 The Sleuth Booth revealed that our Sleuthers were evenly split and totally flummoxed. The questions were indeed entertaining. How long did it take you to assemble the bed, Alex? Luana, how many men were there in your apartment? How did the balcony guy get to the front door so quickly? Bobby, what colour were the guns? Only a psychopath would eat an ice cream cake on the beach. Ending in a delightful playful stand-off following an accusation that Tayler had stolen the smoking punishment story from a TV show. It’s seems very suspicious that your story is exactly the same, Tayler. Was it really true? Let’s find out…. After 2 minutes of Sleuther hubbub and discussion, and arms raised high, votes were cast. There was not much between each Suspect. Tayler came in as least likely to be the liar with her tale of smoking punishment. Followed by Luana and her intruder conundrum. Next came Alex and his childish rogue behavior in the furniture store. 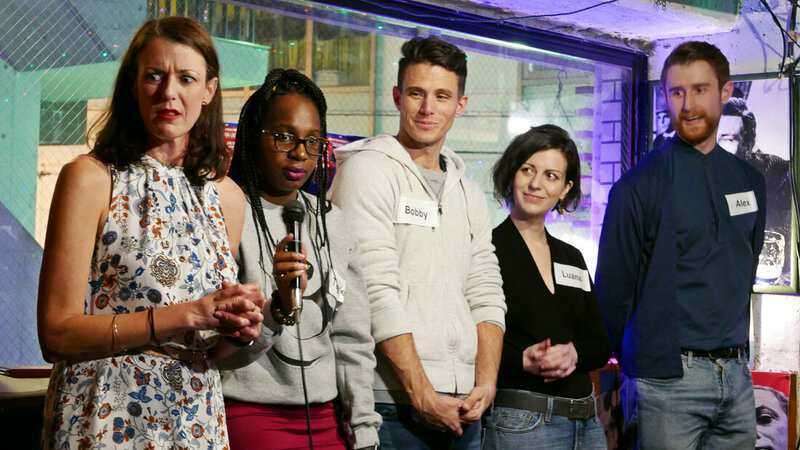 Which meant Bobby was voted as the most likely to be lying with his ice cream cake party on the beach with a SWOT team. The drum roll reverberated on every table and hopes were high. 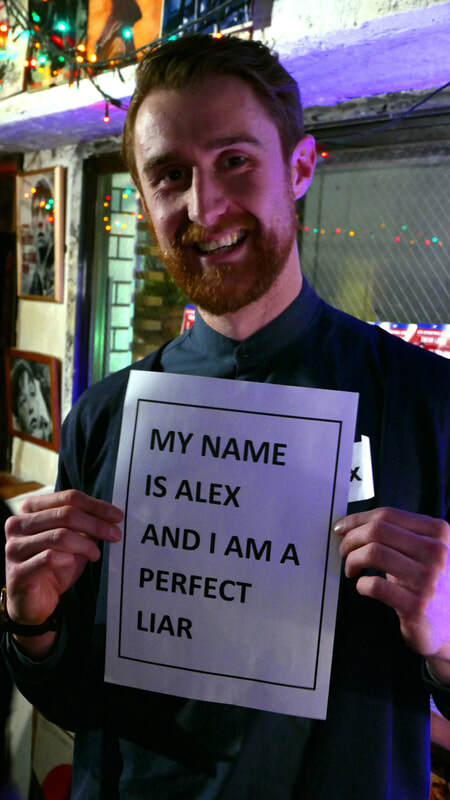 The room exploded with delight and disappointment as Alex stepped forward to claim the honour of the first Perfect Liar of 2019. So, Tayler was telling the truth afterall. Maybe it was her Mum that stole the punishment from the TV program. A good start for the Suspects but can they continue to dupe the Sleuthers at the next show? Find out for yourself at the Love Edition on February 15th. Tickets here.